Online ticket sales closeFriday, 25 January 2019 at midnight. This is also your last chance to buy tickets for the Friday Welcome BBQ. 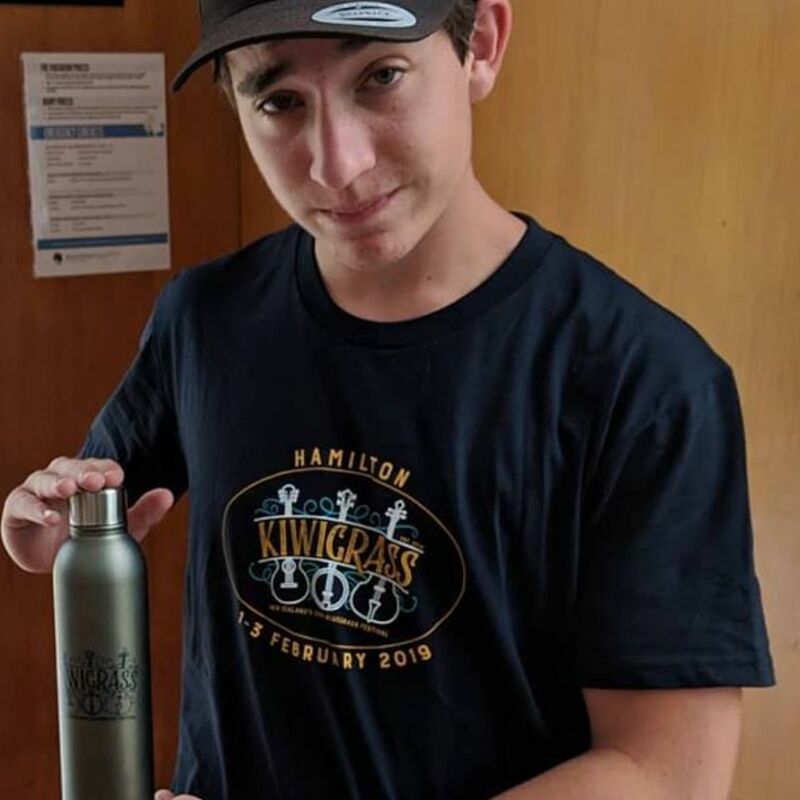 When you arrive at Kiwigrass you will be able to buy tickets to the Sunday Breakfast ($10) and Kiwigrass merchandise including stainless steel, double walled, vacuum insulated hot and cold drink bottles ($30), calico tote bags ($10) and high-quality t-shirts ($30). And don’t forget our amazing raffle! Your $5 ticket gets 5 draws! First prize is a custom made Kiwigrass-branded van der Gaag mandolin. Second is a Paul Trenwith wood practice banjo. Third is a guitar strap and tuner from Keith Macmillan stringed instruments and there will be two fourth place draws for calendar/CD sets from Banjo Babes. We will be able to accept cash and EFTPOS at both venues. Aside from your usual camping gear and comfort items (if you’re staying at Narrows), there are some other things we thought we’d encourage you to bring with you to Kiwigrass. The basics: Hats, sunglasses, sunscreen. It’s summer! A raincoat and warm clothes for the evenings. It’s New Zealand! A chair. All our venues have chairs, but it’s always good to have one for the campground jam sessions. Swim togs and a towel. There’s a pool! NB: children under 18 may not use the pool without supervision of a responsible adult. Plates and cutlery. Even if you aren’t cooking/preparing your own food at Narrows, you can help us meet our sustainability and waste reduction ambitions by bringing your own plates, cups, drink bottles, and cutlery. Just let the food truck operators know you’ve brought your own container when you order your food or beverages. There are kitchens available for washing up after your meals. Camp stoves/cooking gear. If you are camping, don’t rely on being able to cook all your meals in the camp kitchens. They are small and bound to get crowded. Be prepared to cook at your camp. Money! There will be great food and beverages on site. Also, a delightful selection of Kiwigrass schwag to take home as evidence you were there, at the VERY FIRST KIWIGRASS. Things you won’t need: Printed tickets! Bring your booking number(s) and some form of ID with your name on it and we will have a packet for you at the door. You can pick up your packet at Tamahere Hall on Friday, or from the Ticket and Merchandise table at Narrows Park, which will be located near the main concert hall.